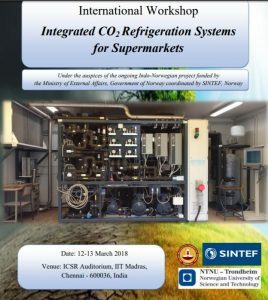 International Workshop on Integrated CO2 refrigeration systems for Supermarkets was organised at IITMadras on 12th and 13th March 2018. 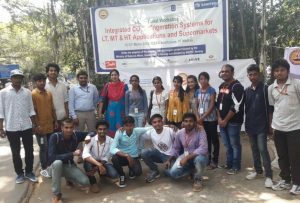 Eighteen students of 4th and 6th semester, Mechanical Engineering Department, NCET along with two faculty members participated in the workshop. 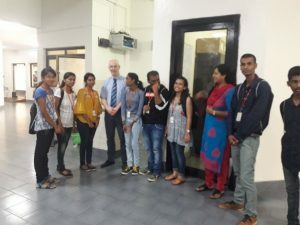 This workshop is a part of the ongoing Indo-Norwegian project (INDEE) being carried out at IIT Madras. The project is approved by the Ministry of External Affairs, Government of Norway through SINTEF and NTNU, Norway. The main aim of INDEE is to eliminate conventional synthetic (man-made) refrigerants which are very popular in developing countries like India. The students got a better exposure of this emerging technology in the fields of Heating, Air Conditioning and Refrigeration (HVAC). The workshop provided knowledge dissemination by means of lectures by eminent speakers from across the globe. The demonstration on 35 kW multi-evaporator (freezing at -29oC, refrigeration at – 6oC and air conditioning at 9oC), multi-ejector CO2 system was very educative. 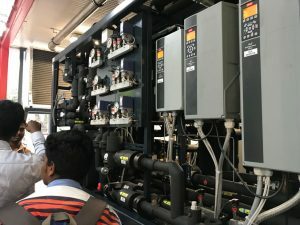 Students learnt that this system has heat recovery facility for waste heat utilization for applications such as milk dairy, hospitals, hotels, etc. India is committed to eliminate the usage of synthetic HCFC and HFC class refrigerants which have high global warming potential (GWP) as per the recent Kigali agreement. A better possible replacement is CO2.The students were able to get a better understanding of the working, the design challenges of CO2 based Refrigeration system and the need for developing such a facility. 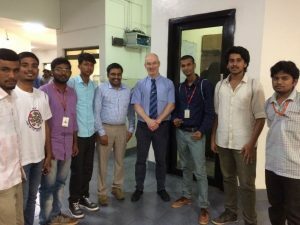 The attendees of the workshop included practising engineers, consultants, industry personnel, students and faculties from renowned Institutions and Industries.